Sun FM will be out and about across Wearside on Friday 25 May. Go North East and Sunderland’s most popular local radio station, Sun FM, will once again be joining forces to mark Local Radio Day this May. Celebrating the partnership that exists between radio stations and their listeners, Local Radio Day sets out to demonstrate the difference that local really makes. 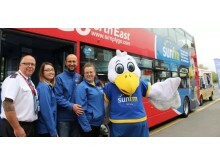 To mark Sun FM’s celebrations, Go North East’s state-of-the-art Sun FM branded double deck bus, will be journeying across towns and villages across Wearside on Friday 25th May. The tour will begin at the Sun FM studios and end in Seaham. Throughout the day the eye-catching branded bus will stop off at 11 locations and Sun FM presenters and station mascot, Sunny the Seagull will be onboard to meet local listeners and hand out prizes.